Moist and flavorful inside, crispy outside plus a side dish — all combined in one pan. 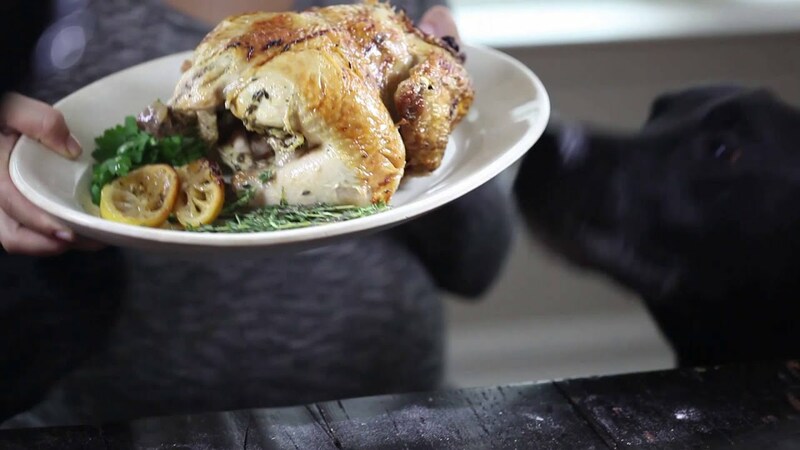 Simple roasted chicken is one of those dishes everyone wants to make perfectly, including me. And while I think I’ve done a pretty decent job in the past with my citrus and herb roasted chicken, I wanted to make it better, with a moist, flavorful inside, crispy outside and maybe even a side dish all wrapped into one pan. I wanted it all. As I was working on this dish the past 6 months, I was getting frustrated that things just weren’t turning out the way I envisioned. The skin wasn’t quite crispy enough, and sometimes the inside was still pink. And so my husband came home one day with Roasting: A Simple Art by Barbara Kafka. I really love this book, and not just for her tips on roasting chicken. But the tip I took to heart most of all was the cooking temperature. Previously I had been cooking my chicken in a 400 degree oven, but her roast chicken recipe called for 500 degrees. So I gave it a try, and it was one of the elements that has been missing to making a coveted roast chicken. I also started adding a whole onion to the veggie mix and I really loved how it caramelized while cooking. You can usually find me eating most of the cooked onion before I actually serve the chicken. Oops. You can use any spice blend you like, but I do recommend marinating overnight in a mix of dry and wet ingredients, such as dried or fresh herbs, citrus, wine, olive oil, soy sauce or fresh juice. I don’t use honey when I marinate because I find it tends to burn once you put it in the oven. Below I recommend the mix I like most for this dish, but you can really make any flavor combination you like. I also recommend using either an upright chicken roaster (they cost less than $10 and they are awesome) or a classic roasting pan with rack, which is especially ideal for an all-in-one-dish like this. While the chicken cooks, the juices and seasoning drips down, flavoring the potatoes, carrots and onion with fatty chicken goodness. I think it’s really the best part. And while roast chicken is a Friday night staple, I often find myself making a chicken like this at the beginning of the week, because it is truly an easy dish that is delicious and versatile to enjoy all week. Rinse chicken in cold water and pat dry with a paper towel. Place in a sealable plastic bag. Combine dried spices, lemon juice and zest and olive oil in a small bowl. Whisk until combined. Pour over chicken and seal the bag. Massage the marinade all over the chicken until completely coated. Place in fridge overnight or up to 24 hours. Place potatoes, carrots, onion and garlic cloves in the bottom of a roasting pan, or spread out in an even layer on a large baking sheet. Drizzle with around 1 Tbsp olive oil, and salt and pepper. If using a roasting rack place chicken on top, allowing spice mix to run all over veggies. 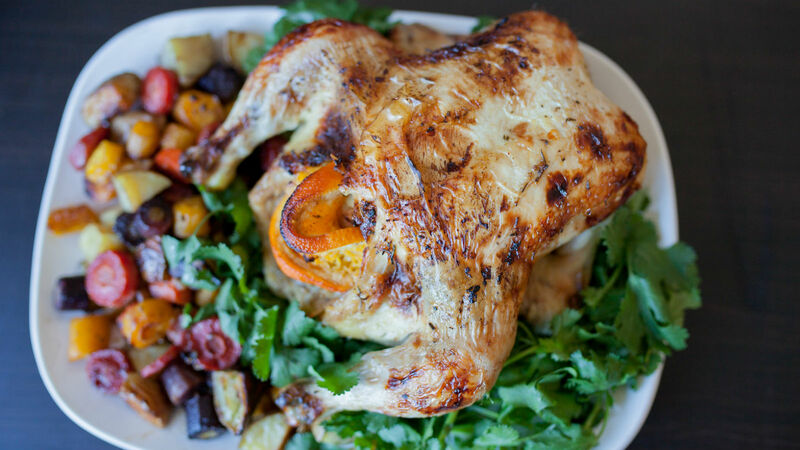 If using an upright roaster, place chicken on rack in the middle of the large baking sheet, so that the veggies are surrounding the chicken. Cook for 30 minutes. Reduce to 425 degrees and flip vegetables to ensure they get caramelized on all sides. If using an upright chicken roaster, pour some of the liquid all over the potatoes and carrots. Cook for another 20-30 minutes, or until juices run clear and a meat thermometer reads 160 degrees. Allow chicken to cool slightly before cutting. Serve with roasted veggies and fresh parsley if desired. Super cripsy chicken + zingy, fresh slaw makes for one extra special Israeli-inspired sandwich. This Israeli-inspired dish is incredibly delicious and easy, and is equally awesome for a weeknight dinner or Shabbat.